This story was one of TheOneRing.net’s April Fool Jokes for 2012. Thank you for participating! Shipping a building, brick by brick, is certainly costly but not unheard of. The most famous such occurrence was of course the shipping of London Bridge, in 1962, via boat to California and thence to Arizona. 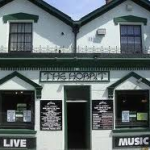 There’s no word as yet to the exact location intended for the relocated Hobbit pub; TORn is keeping an eye on events in the hope that it might be a possible location for Oscar happenings next Spring! Meanwhile, we have yet to see how the current owner – and supportive regulars – will respond to this purchase offer. It seems unlikely that they would let their beloved local go without a fight. As ever, we’ll bring you the latest as we hear it!